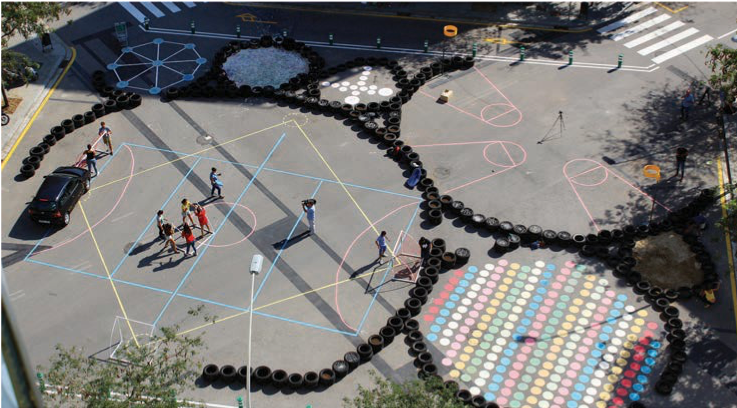 We are happy to be able to share this excerpt from Beyond Mobility: Planning Cities for People and Places by Robert Cervero, Erick Guerra and Stefan Al, published by Island Press. The publisher has provided a 25% discount code with us for anyone who would like to purchase the entire print or e-book. To use the discount code, go to https://islandpress.org/books/beyond-mobility and use the promo code BIKELEAGUE. In the 1980s, traffic engineer Hans Monderman conducted an experiment in Oudehaske, the Netherlands. 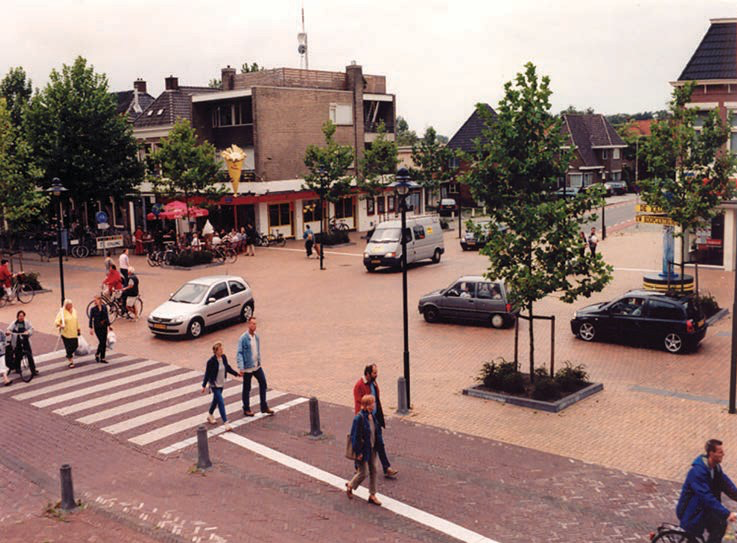 He removed all road signs, signals, and road markings and made all pedestrians, bikers, and cars share roads and squares equally, creating a “shared space” (figure 2-1). As a result, all travelers paid greater attention to each other equally to keep everyone safe. Drivers were found to have reduced their speed by 40 percent because of this increase in perceived risk. Monderman’s trial was so successful that other towns including some in Denmark, Sweden, and Germany have taken similar measures to reduce the number of traffic accidents. Shared spaces epitomize how balancing mobility and place-making can benefit com- munities. The experiment reestablished interpersonal awareness between all road users and reclaimed streets for pedestrians, allowing them to move and interact with another in new ways. By deemphasizing vehicle throughput, curbless streets become destinations. With some modifications, Monderman’s concept of shared space can improve safety and sociability in larger cities as well. There is also promise in converting one-way to two-way streets. A study in Louisville, Kentucky, showed that a conversion not only decreased traffic accidents (as well as traffic flow) but also led to the increase of livability, with reduced crime and increased property values. Some cities, including Mexico City, Bogotá, San Francisco, Philadelphia, and New York City, have even begun to implement open street programs, where roads are blocked off for several hours to allow people to walk freely, roller skate, or play games in the streets. Instead of focusing on allowing cars to travel as efficiently as possible, neighborhoods should have streets that are designed to make neighborhoods more livable to other users as well. The most comprehensive approach to benefit communities is the “complete streets” concept, a street designed for all users, not just for drivers, but also for bicyclists, transit users, and pedestrians of all ages and abilities.